Is Ocean Prime worth the cost? On my father’s 85th birthday evening, we choseOcean Prime, a restaurant where none of us had been in Beverly Hills . My mother had just heard about it from a friend who raved about their beautiful bar area. We thought we’d try it and booked a reservation. Ocean Prime Beverly Hills is part of a national chain of restaurants, which is expanding further its reach in California later this year. The space for the restaurant, bar and terrace is quite large, yet welcoming. When we arrived at the reception desk I felt as if I was checking into a resort or a spa. Excited anticipation of a special experience awaiting us filled the air. Ocean Prime, located in the heart of Beverly Hills, offers a quality dining experience with excellent service and tasty food. The prices are a bit high, yet probably within the range of similar restaurants in the proximity. I definitely would recommend Ocean Prime. The sophisticated decor of the dining room resembles a restaurant you might see in New York City. 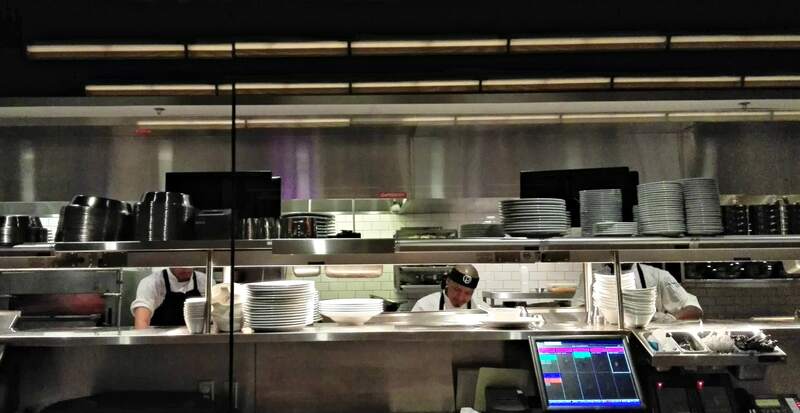 Wood-paneling covers the walls, with a large window across one side so customers can view the kitchen action. Music played in the background as conversations from the other tables joined in the noise. About halfway through our dinner the music and conversations quieted down, making it easier for us to talk and for my father to hear. Those seeking a quieter dining experience might request to be seated in the back dining area where it is calmer and more private. The menu offers many classic seafood and meat choices, with delicious side dishes. Ocean Prime features various kinds of sushi as one of the choices for an appetizer. Although the main courses were for the most part attractive, the side dishes intrigued me more. Many dishes (appetizer, main dishes and side dishes) contain black truffle or white truffle in one form or another, usually as an oil. As I find truffles can easily overpower other flavors in a dish, I was a bit reluctant to order some items that would usually tempt me. Ocean Prime fortunately offered Parmesan Truffle Fries, one of the few ways I enjoy truffles. Truffle lovers would be happy at Ocean Prime and might even order the Black Truffle Mac & Cheese as a side dish. 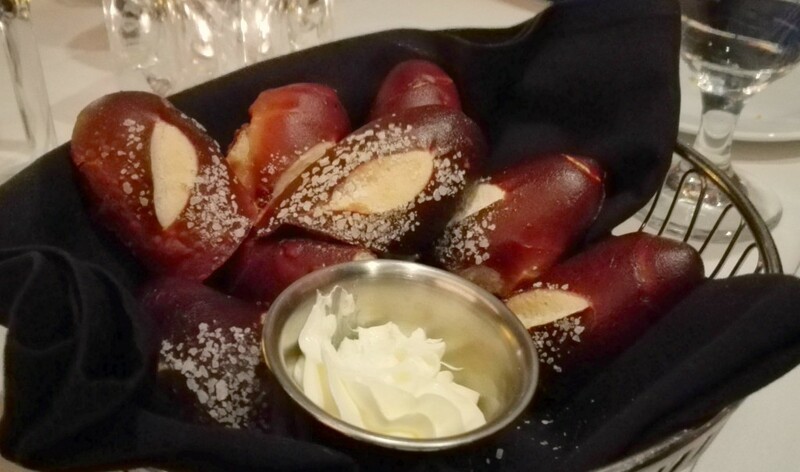 While we waited to order, pretzel bread rolls and slices of sourdough bread whetted our appetite and promised quality food to come. We also enjoyed our cocktails to mark this special occasion. 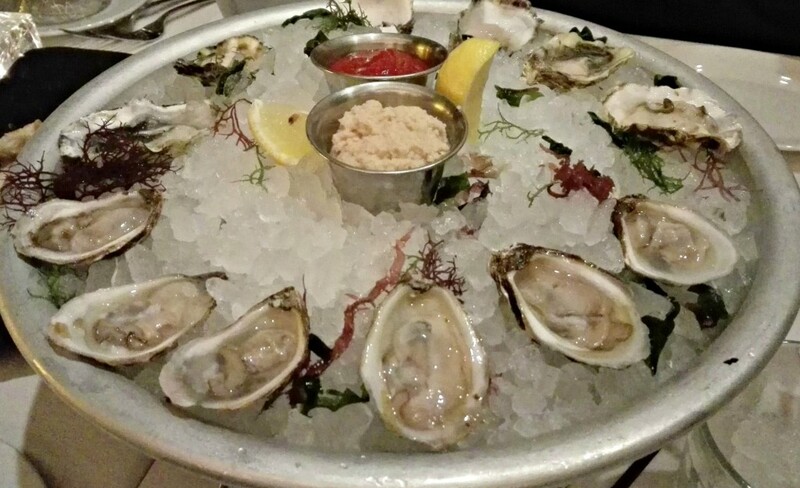 I shared with my brother and father a mix of West Coast and East Coast oysters as a starter. The oysters were very fresh and tasty, yet a bit smaller than usual. Cut lemons, horseradish sauce and cocktail sauce accompanied the oysters. 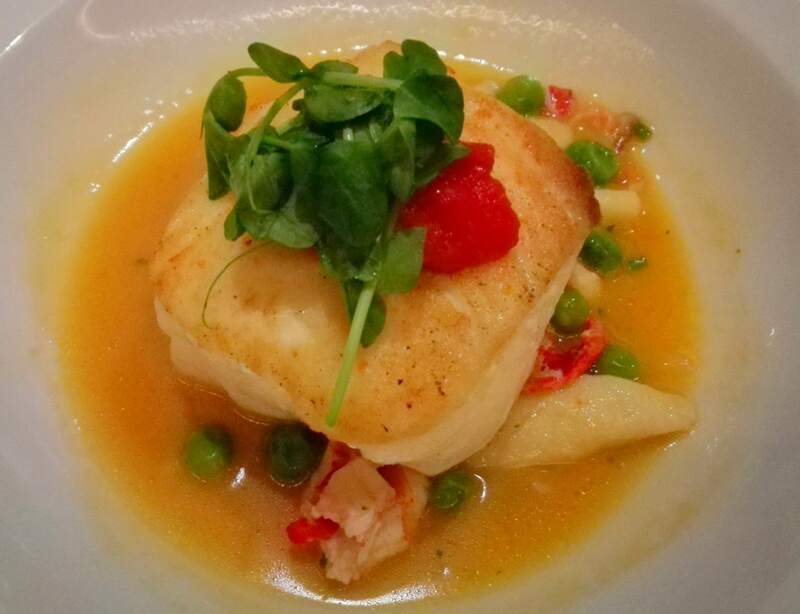 For my main course, I chose the Pacific Halibut with Lobster, Gnocchi, Spring Peas, and Lemon Jus. The dish was presented elegantly; the portion was reasonable. However, I was a bit disappointed by how small the pieces of lobster were as well as the number of gnocchi. The lobster and gnocchi seemed to be added as a garnish, rather than as a part of the main dish. 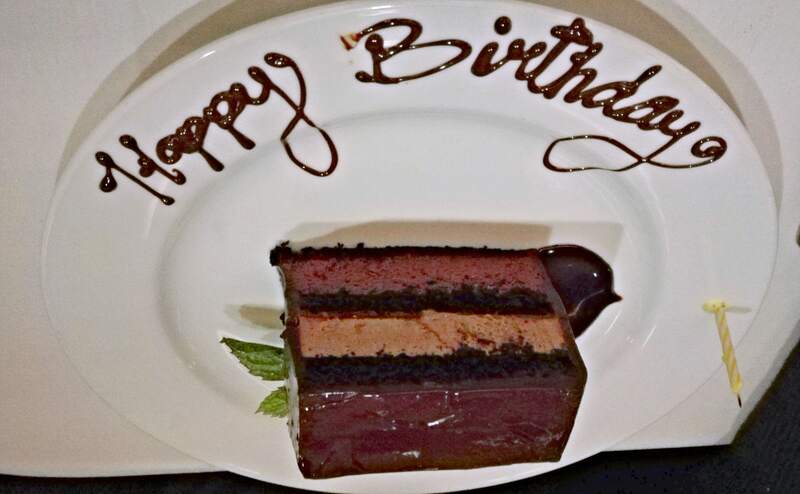 Ocean Prime brought my father a slice of chocolate cake with “Happy Birthday” written in chocolate sauce on the top of the plate. 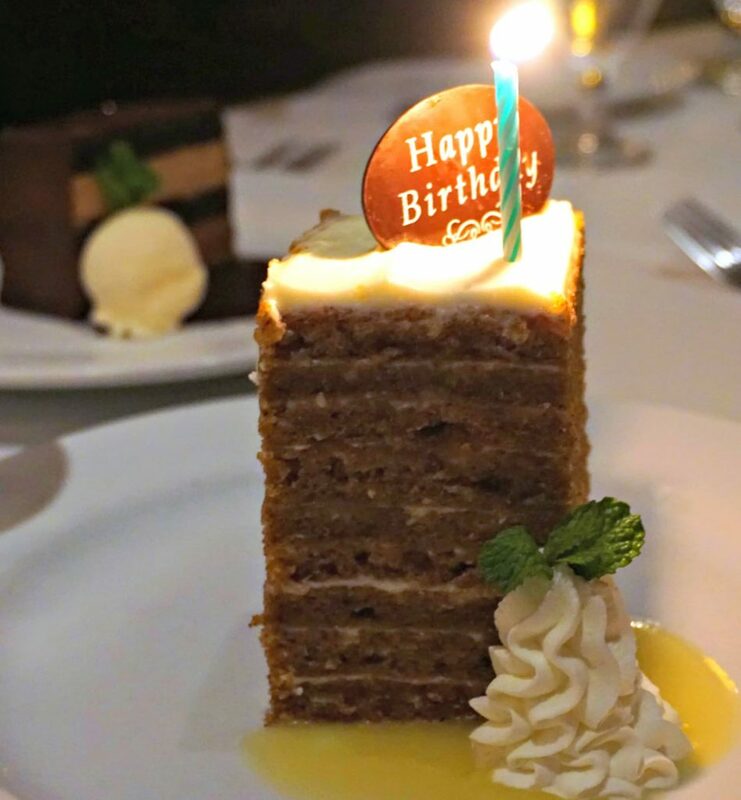 I ordered the Ten-Layer Carrot Cake for dessert. The server warned me that the carrot cake is without nuts and raisins. I generally like walnuts and raisins in my carrot cake yet ordered it anyway. I was so happy I did, as it was full of flavor, moist and just plain delicious! The service throughout the evening was excellent and professional. We felt attended to at all moments. We all enjoyed very much our evening and each said we’d definitely come back to Ocean Prime again. Ocean Prime is on the pricey side, yet not much more than other steak and seafood restaurants of this quality in the area. Did I think it was worth the cost? Perhaps not if I were going to Ocean Prime frequently, yet for a special occasion or a periodic treat, yes! Try this sophisticated restaurant with tasty dishes for a special occasion and decide for yourself if it is worth the price.